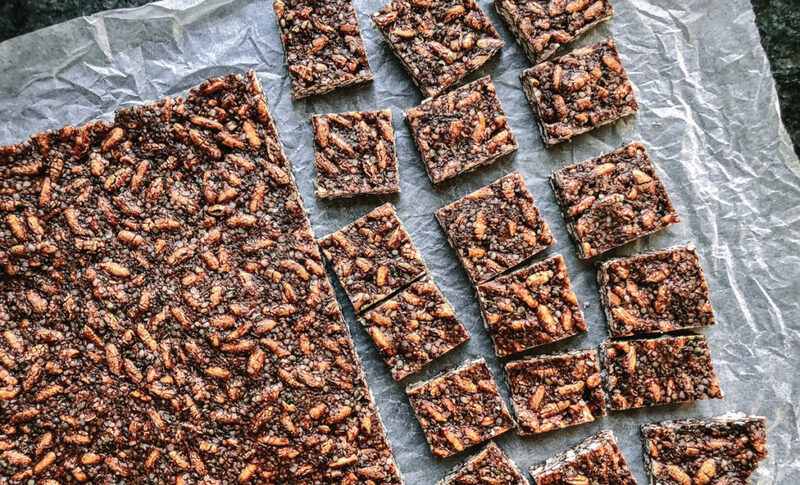 This totally vegan recipe is the perfect balance between chewy, chocolate and crunchy. Naturally free of gluten and sugar, this homemade chocolate bar will rival anything you can find on the shelves, plus you’ve got extra goodness from the addition of our yummy hemp seeds. Trust us, this dessert is delish! 1. Melt coconut oil in a medium sized saucepan on low heat. 2. When coconut oil is melted take off heat and add rice malt syrup, vanilla, salt and cacao powder, mix well with a whisk until all ingredients are combined. 3. Mix through the brown rice puffs, when they are well coated in the chocolate mixture add the hemp seeds, desiccated coconut and buckwheat. 4. Once the seed mix is well coated, spread thinly into a baking paper lined baking tray. Pat down well with a spatula. Refrigerate until ready to cut and serve (30mins or so to set).